Akshay Kumar is back with his new movie after a wonderful performance in his last, Baby. When you come back after such a movie, there are very high expectations from the audience and you are meant to do a better sensible movie than the previous one. 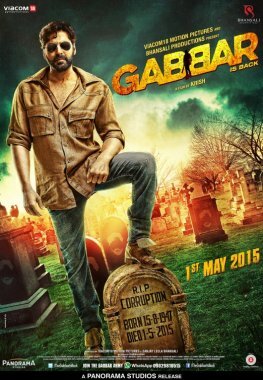 "Gabbar is Back", his latest is something we have seen Khiladi Kumar doing a lot of times in 1990s and 2000s. But as its 2015, we were expecting something new from him in a movie based on the same premise. Still, something positive out of this movie you can take away is Akshay Kumar at least working in the movies that he used to rather than the new nonsensical ones he started starring in. Though critics must have thrashed Gabbar is Back, I am not much disappointed because I am even happy if Akshay Kumar keeps working in the movies like Special 26, Holiday, Baby and Gabbar is Back- the movies that suits him well. Akshay Kumar is almost in every frame and therefore, the movie is carried on his shoulders alone. His performance is solid but the problem lies in the role given to him in the name of the character, Gabbar- whom we know as the biggest villain ever in Bollywood. According to that, the character of Akshay isn't very aggressive, violent or dangerous. He is quite soft compared to that. Shruti Hassan is good in whatever minutes she have in the movie. She plays a showpiece in the movie just to attract few male eyeballs otherwise she doesn't have anything to do. Suman Talwar plays his part well but it looks very repetitive because of several villains in the same skin in previous south-remade Bollywood movies. Kareena Kapoor charms in that one song itself. She looks extremely beautiful and makes you forget Shruti, who's the leading lady in the movie. And coming to Sunil Grover, he has really mind-blown with his performance. He has shown that he can do serious roles as good as he does Gutthi. Winner Performance by him! The direction is done keeping those audiences in mind who believe in masala movies and entertainers. If you are in the theater to search for logic and sense in every scene, you will have to bang your head to the wall. Few scenes are extremely foolish and senseless but in the name of masala movie, let's not get much into them but still they are the flaws. The songs aren't much intriguing except Teri Meri Kahaani which stars Kareena Kapoor though it looks quite out of sync because of its white background. Back ground music is fine as it makes you feel the excitement in the movie in the scenes that matters. Action scenes are the same that we have seen in 15446789 movies recently. Yes! I will go with 3 stars out of 5. And ya, Akshay Kumar's bearded look is great and suits him very well.